Thanks to advances in automotive technology and driver education, commuting in the United States has never been safer. Unfortunately, roughly 40,000 Americans still die in road accidents every year. Excessive speed is often the primary culprit in fatal crashes. Asphalt speed bumps have been proven to significantly reduce traffic accidents. Prior to installing speed bumps, it’s important to consider their benefits and drawbacks. By forcing drivers to slow down, speed bumps greatly reduce the frequency of minor fender benders and serious collisions. More importantly, they’re quite effective at reducing automobile accidents involving pedestrians. Consequently, they’re a great traffic-control solution for neighborhoods with a lot of children, elderly people, and pets. Ultimately, speed bumps save lives on a daily basis. In order for speed bumps to deliver the best results, their dimensions and layout must be tailored to the specific road conditions at hand. While rubber and metal speed bumps come in many shapes and sizes, they’re simply not as flexible as asphalt variants. Since asphalt bumps are poured in place, they can be configured to deliver fine control over driver behavior. All in all, speed bumps are a terrific value for municipalities and neighborhood associations looking to effectively lower traffic speeds. While speed bumps cost more to install, they’re more resistant to damage than many metal or rubber models. What’s more, repairing bumps as they experience wear and tear over the years doesn’t cost a lot of money. For the most part, the average citizen understands the importance of curtailing speeding on roads where it’s not appropriate. While speed demons often complain about speed bumps, the reality is that safety-conscious residents don’t typically mind them. Asphalt speed bumps that are an appropriate height and aren’t placed too close to each other probably won’t provoke a backlash. One of the few major drawbacks of speed bumps of any kind is that they often increase perceptible road noise. Vehicles passing over speed bumps are simply louder than those that are cruising down a level surface at a consistent speed. Furthermore, cars and trucks produce louder sounds when they brake before hitting speed bumps and accelerate quickly afterward. It’s true that emergency personnel like EMTs and firefighters that drive large, cumbersome vehicles aren’t huge fans of speed bumps. In life or death situations, a 30-second delay in reaching a person in distress or delivering that person to a hospital can be fatal. Fortunately, speed bumps can be arranged to easily accommodate wide emergency vehicles such as ambulances. Another big drawback of speed bumps is the damage they can cause to vehicles with fairly shallow ground clearances. If you attempt to drive a Porsche 911 over an asphalt bump at a high rate of speed, you might crack your front bumper or seriously compromise your oil pan. Nevertheless, proper signage will prevent these incidents if drivers pay attention. 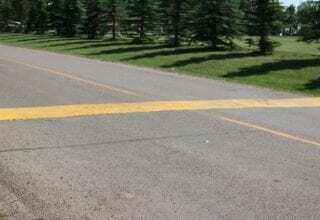 As great as speed bumps can be, their presence often causes unintended consequences. If you put speed bumps on one street, commuters that drive too fast will alter their routes to avoid them. In other words, you may simply be moving the problem around. An experienced transportation consultant can help neighborhood groups and cities devise speed bump plans that don’t disrupt traffic flow. In many ways, hiring the right speed bump contractor is the key to getting the most from your traffic-control efforts. Southern Asphalt Engineering is an experienced installer of asphalt and concrete speed bumps serving Miami-Dade and Broward counties with a long track record of excellence. Call us today to get a free estimate on your next speed bump project!